To sleep on that porch, was really not a bad idea. I was sheltered from wind and rain, so I stayed warm the whole night through. I was still hungry after breakfast, so I thought I could buy some more food in a shop I had located on the map, only 5 km away. To my dismay, it was closed. So I asked Mr. Google again, and he suggested another shop, another 5 km ahead. This time, google got it right, and I could buy myself a second breakfast. The young girl working there, thought I looked cold and offered me a warm cup of coffee. What was more, when I asked if they sold umbrellas, she went and found one somebody had left behind, and gave it to me. I was so happy, it was a bigger and a more robust umbrella than my colourful one, and I thought it would handle the difficult weather well. After only 10 minutes, I was taken by surprise, when the wind suddenly changed direction and turned my new umbrella inside out and ripped it completely to pieces. I cried. And I cried. I was not only grieving my umbrella, but my tears were for every single difficulty I had faced the previous days, it was from tiredness, pain and frustration. The poor umbrella was only the trigger. Luckily, it was only a light drizzle, so by the time I had gotten to a shop to buy a new umbrella, I was still quite dry. Not wanting to make the same mistake again, I called the camping site in Hornnes to make sure it was open before going there. Upon my arrival, I couldn’t find anyone, and the reception area was closed. I then headed straight for the sanitary building, just to get away from the wet and windy weather. I took of my wet things and hung them up to dry. My God, I want to go home. Day 117 - Go, Kaja, go! Have you ever tried to sleep in a room with a light sensor? And a very sensitive sensor at that. Just imagine, every time you turn around, scratch your nose or adjust your position - FLASH (aa-aa) – the light turns on. Sleep deprived as I was, I went out into the rain and stumbled my way down the road. The rivers and the streets were flooded with water, and I was ever so grateful for not being in the terrain right now, but on a solid road with a big umbrella. Even though my backpack was getting lighter, it felt heavier. My body was so tired, I had to sit down every 10 minutes. The pain in my back made it hard to breath and seeing as I didn’t have a good night’s sleep since Rjukan, my energy level was quite low. But the thought of being almost done, kept me going, it gave me enough adrenaline to push on. Before nightfall, I found an abandoned barn and pitched up my tent inside it. The ground was soft and comfortable, and soon the tiredness consumed me. Come now, Mr. Sandman. Aaah, 70 kilometres to go, which meant two long days if I wanted to be at Lindesnes by the 24th. Go, Kaja go! Day 118 – Thumbs up! I woke up at 5 A.M. feeling at peace and well-rested. I had slept for 7 hours straight! I guess I was pretty tired and in dire need of a good night’s sleep. It was still dark when I started walking. To my delight, it had stopped raining during the night, so I enjoyed the crisp, clear air. I filled up my water bottle in a nearby stream and got back on the road. I really enjoyed my hike that day, even though it was a long one. I walked along several lakes and rivers and the autumn colours were still lingering in the trees and on the ground. 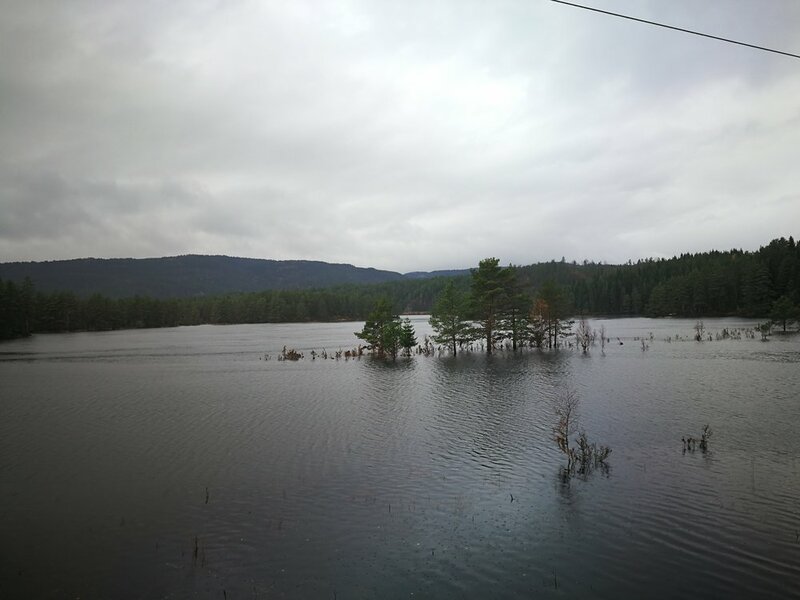 I passed several villages through the valley of Audnedal municipality, and they all had their own charm. In Konsmo, I stopped at the local shop for lunch and a free cup of coffee. 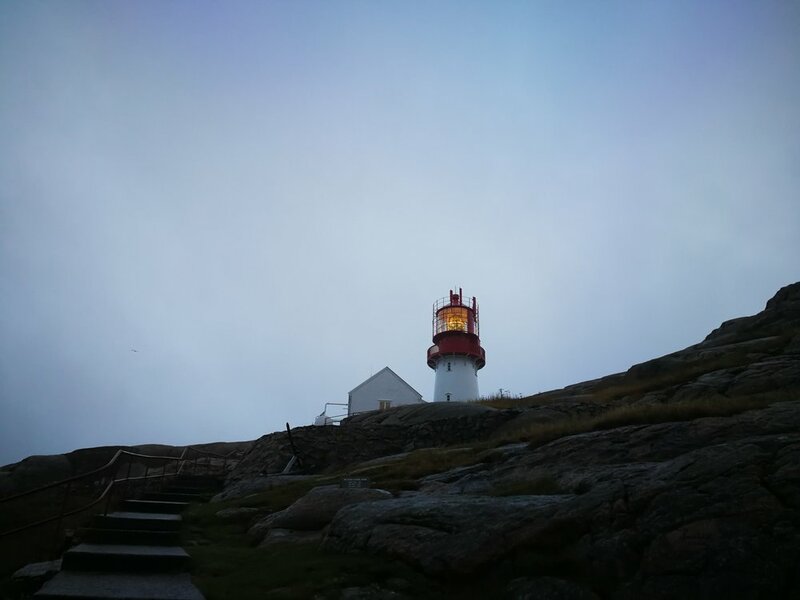 Along the way, people waved at me, shouting "are you going to Lindesnes?" and then giving me the thumbs up. Most people doing NPL go through this valley, so the locals here are used to meet long distance hikers. They made my day. Some stopped their car or their bike for a talk, some took a break from their garden work for a chat. Just when it started to get darker, I came across a big field where a father and his daughter were picking apples. They were just finishing up, so I met them when they reached the road. We joined company for the 300m walk they had to their house, and when we parted, I got an apple. After 35 kilometres, I was done. I found the perfect spot on top of a hill under a huge spruce tree, close to a river. It was weird to put up the tent, knowing it was for the last time. My last day. I could hardly believe it, but that’s what I told myself over and over to get enough courage to pack down the tent and go out into the pouring rain. Man, did it pour down. Even with my umbrella I was wet after 5 km, but I would have drowned without it, so I was grateful all the same. In Vigeland, I entered the gas station to use their toilet and I also treated myself with three newly baked chocolate-buns and a steaming cup of coffee before continuing. To my delight, it stopped raining after a while. It was nice to get a break, it was easier to enjoy my surroundings when I didn’t have to hide under my umbrella. The smell of salt hit me before I saw the ocean. That made me realise how far I had walked and how close I was to my end destination. People kept shouting encouragements at me while I was walking. Their southern dialect was like a friendly reminder of where I was. I was ecstatic. Even the renewed shower of rain couldn’t bring me down. I no longer cared about being wet, I didn’t even bother to avoid the pools of water. Getting closer, I started to feel nervous, I didn’t know what to expect. But when I saw the top of the lighthouse, I screamed out in delight. 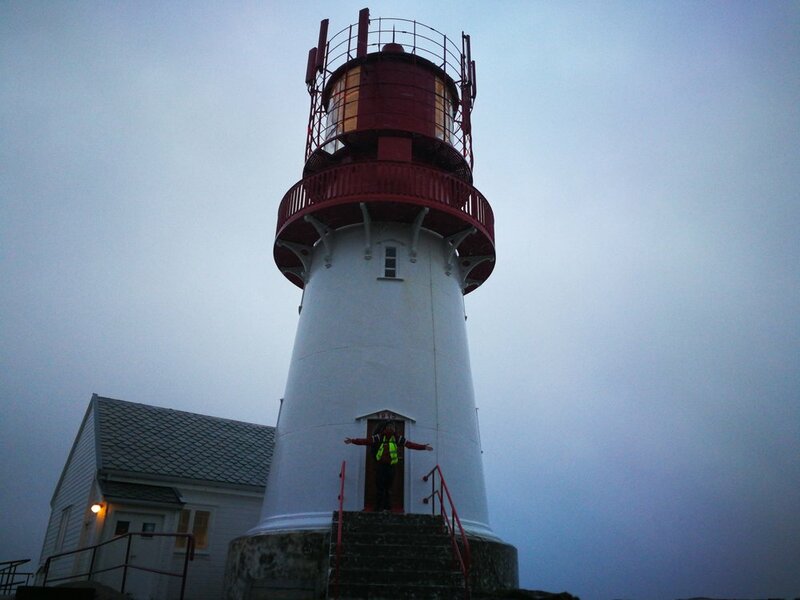 Simon got there before me, so when I finally arrived, I could run into his arms, and together, we walked up to the lighthouse. It was not pleasant, because it was raining harder than ever, and the wind was so strong. Poor Simon stood there, trying to take a decent photo of me, and soon both he and the camera were almost as wet as me. After a few attempts, however, I just wanted to leave. Rain and disappointment washed over me. It was a moment I had been picturing in my head for three months, and I felt that everything went horribly wrong. But Simon was there, holding me, supporting me and comforting me. That he could be there with me, was a true blessing. Once I was back in the car and out of my wet clothes, I could wipe away my tears and a calmness came over me, I felt grateful and content. 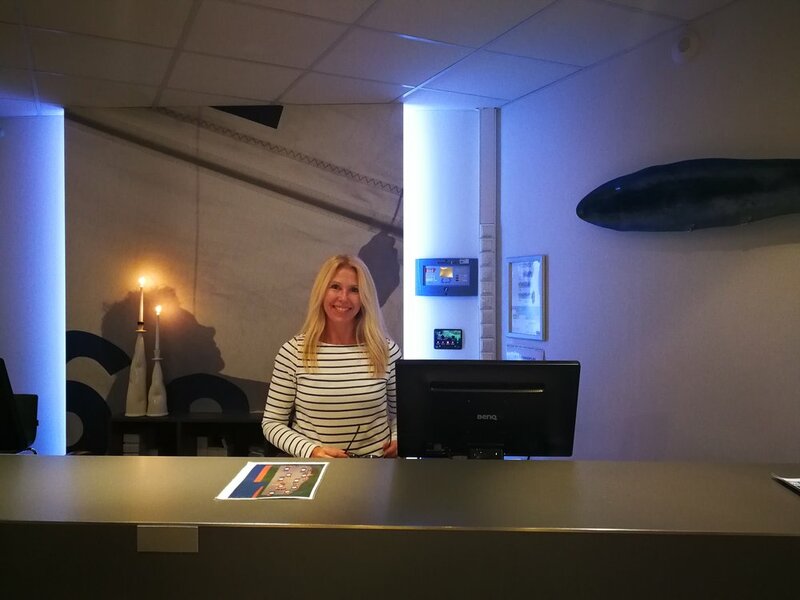 A feeling which intensified when my dad and Liv called me to tell that they had made a reservation for us at the Lindesnes Hav Hotel. 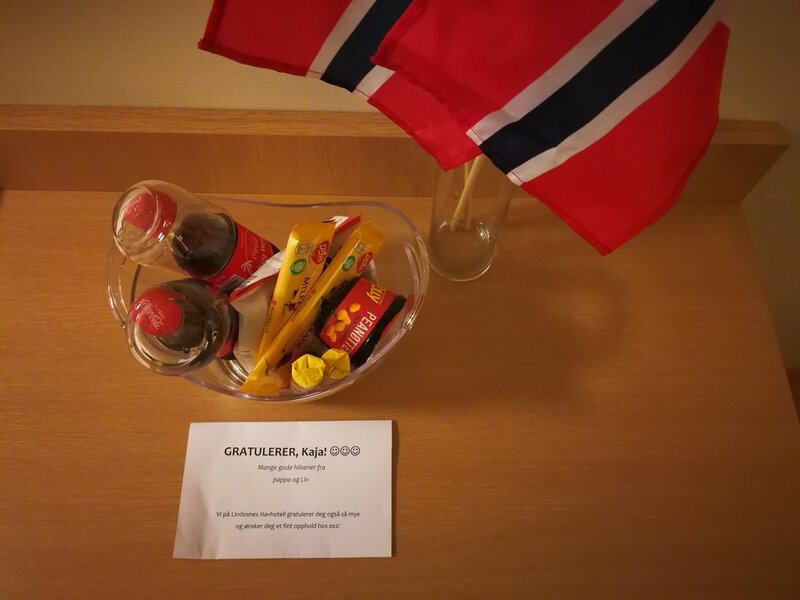 The lady in the hotel reception greeted us with a warm smile, and when I told her my name, she said “oh, you’re the one who just finished Norge på langs!” My dad had left instructions for her to give us a room with a view and to fill the room with candy. After a long, scalding hot shower, I sat in the bed trying to wrap my head around that my trip was now over. No more carrying Mr. Skywalker until my back is aching. No more wet shoes. No more walking. Just the thought of not having to dry my socks with body heat, made me happier than I could express. From now on, wet and dirty socks go into the washing machine.